4RealSim welcomes you to attend a webinar introducing the Abaqus/CAE QA report generator. Simulation reports are an important step at the end of a project to review the FEA project. On the other hand, generating simulation reports can be time-consuming, it is easy to make mistakes and it feels like monkey-work. 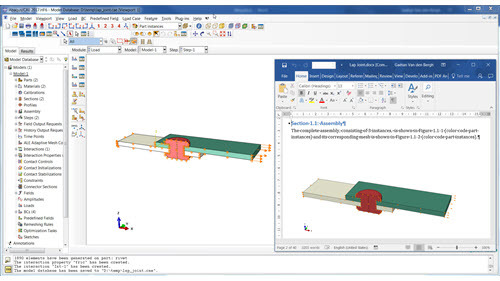 4RealSim has developed a Abaqus/CAE plug-in that creates a Microsoft Word or pdf report automatically from the model description. The word report contains an extensive overview of the model. This facilitates the simulation model review process, and helps identifying errors. We have released the second version of the Abaqus QA report generator, and during the webinar we will review how it works and what features are supported. Every Abaqus user that needs to generate simulation reports in a fast and efficient way. Do not hesitate and benefit from the QA report generator.